Many women today feel their life is constantly in fast-forward mode-juggling careers, family and personal time. 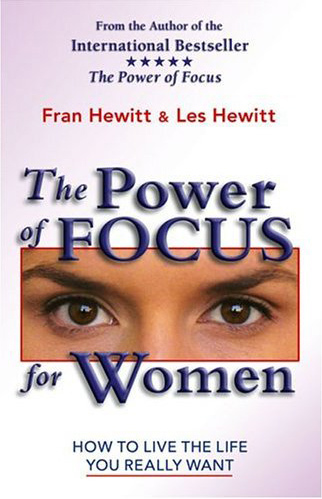 The Power of Focus for Women offers practical solutions for the real day-to-day issues that confront women from all walks of life. Topics include Reality versus Fantasy, The 5 Deadly Burdens, Shedding the Masks We Wear, Setting New Boundaries, Creating an Excellent Balance, Knowing What You Want and Why and many more! Many women today feel their life is constantly in fast-forward mode-juggling careers, family and personal time. The Power of Focus for Women offers practical solutions for the real day-to-day issues that confront women from all walks of life. Similar to the format of the original best-seller, these solutions are highlighted as ten specific focusing strategies. Each chapter includes inspirational success stories and offers easy-to-implement action steps that will help women make significant improvements in their lifestyles. Topics include Reality versus Fantasy, The 5 Deadly Burdens, Shedding the Masks We Wear, Setting New Boundaries, Creating an Excellent Balance, Knowing What You Want and Why, and The Challenge of Change. More than any other time in history, women around the world are now ready and waiting to create the life they REALLY deserve. This book shows them how!